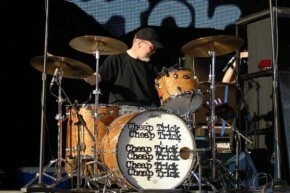 Understanding how to properly tune your drums is the foundation of an excellent sounding drum kit. In this guide we will begin with the tuning of the snare drum. But first we will go over a few drum tuning tips. When it comes right down to brass tax, drum tuning is not incredibly specific. There is really now perfect way of tuning your drums. The best way to go about things is to really play around with various tunings and stick with what works for whatever sort of music you are playing. With that in mind let’s get started by tuning the snare drum. This job will require a tool known as a drum key. This drum key will be used to loosen and tighten the lugs that go all the way around each of the drum heads. You can find drum keys at just about any music shop for around $2.00. After you procure your drum key, the first thing you will want to do is to turn off the snare on your snare drum. 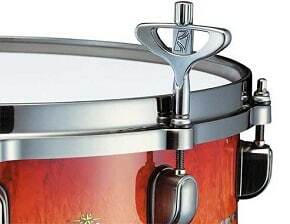 There should be some sort of lever on the side of the snare which loosens the snare underneath the drum. This job will require a tool known as a drum key. This drum key will be used to loosen and tighten the lugs that go all the way around each of the drum heads. Start with any lug on the snare and begin by loosening each lug by only a single turn of the drum key at a time then move on to the next. Just keep going around the drum until you are able to loosen them by hand and remove them. Since we already have removed all of the lugs on top of the drum we now remove the metal ring that holds the drum head on. It is a good idea to wipe the inside of the drum and around the top rim with a dry cloth to remove any dust or debris. The next step is to set a new drum head on and replace the metal ring. Tighten up all of the lugs with your hands until they are all finger tight. Before breaking out your drum key and tightening everything down you need to break in your new drum head. This is done by pushing down on the center of the drum head five or six times. You are not going to break the snare drum head. This technique stretches the head out a bit just like new strings stretching out on a guitar. After a few hard presses with your fist, make sure that all of the lugs are still hand tight and then begin using the drum key. This is where it gets a bit confusing. 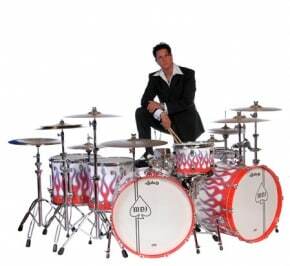 Whichever lug you start with, you must the next one will be directly across the drum from you; on the opposite side. After you tighten the first two a few turns you simply move to the left one lug and then across again. Do this all the way around the drum until the new head seems somewhat tight. Go around the snare drum and tap with a drumstick about an inch away from each lug. Each tap on the drum should sound nearly the same. If not you can use your drum key to fine tune each of the lugs. The top or batter head of the drum should be a little bit tighter than the bottom reso head.If your drums are giving off a lot of echo or overtones, it is a good idea to get a dampening system like moon gel or drum gum. Once you get your snare drum cracking nicely it is time to move on to the toms. We replace and tune each of the tom toms just like we did the snare drum, the only difference is that the toms and floor toms have no snare along the bottom. Remember to experiment with different drum tuning until you find the sound that is right for you, or check out drum tuning gear and tuning tools to help you tune your drums.